What’s In the President’s Universal Preschool Plan? 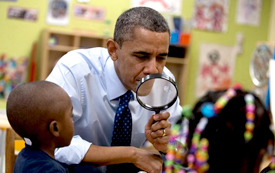 President Obama sent a clear signal about the importance of early childhood education when he announced a proposal to make universal preschool available to all children nationwide. The plan includes a series of new investments intended as the foundation for a continuum of high-quality early learning for a child - beginning at birth and continuing to age 5. "Every dollar we invest in high-quality early childhood education can save more than $7 later on - by boosting graduation rates, reducing teen pregnancy, even reducing violent crime, " the President said during his State of the Union Address speech. "We know this works. So let's do what works and make sure none of our children start the race of life already behind. Let's give our kids that chance." High-quality preschool supported through a new federalstate cost-sharing partnership managed by the Department of Education. This would expand high-quality public preschool to reach all 4-year-olds from low- and moderate-income families whose incomes are at or below 200 percent of the poverty line. A new Early Head Start-Child Care partnership would support communities that extend Early Head Start availability, as well as child care providers that can meet high standards of quality for infants and toddlers. Voluntary home visiting programs to reach additional families in need. These programs enable nurses, social workers and other professionals to connect families. The President's proposal also encourages states to provide additional opportunities for children to attend full-day kindergarten and extends important investments in the federal Head Start program. In order to access federal funding, California and other states would have to meet a number of quality benchmarks linked to better outcomes for children, including state-level standards for early learning; qualified teachers for all preschool classrooms; and a plan to implement comprehensive data and assessment systems. Preschool programs would also have to meet common and consistent standards for quality across all programs, such as well-trained teachers who are paid comparably to K-12 staff; small class sizes and low adult-to-child ratios; a rigorous curriculum; and effective evaluation and reviews. Cost estimates for the initiative have not yet been released, nor a plan on how it would be financed. But White House officials have said the money could be found in the budget, and the program would not add to the deficit.